I have always loved Taiwanese bakeries. Even back at the beginning of my life in Taipei, I often indulged my passion for cakes and pastries by making the rounds of my favorite baked goods shops. These buns were one of my most memorable crushes. And now you get to taste why. 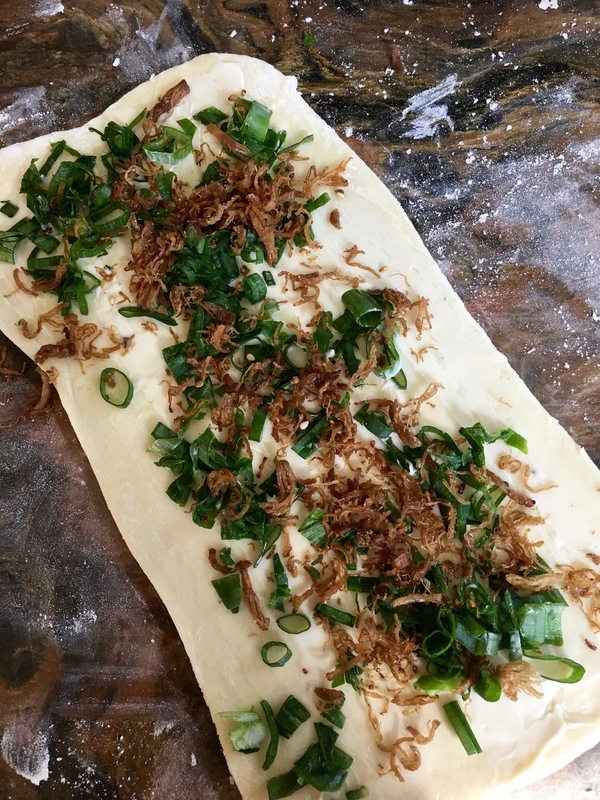 If you like things like scallion pancakes (cōngyóubĭng 蔥油餅), where the fragrant green confetti of chopped green onions collides against a dab of oil, a sprinkle of salt, and enough starchy goodness to spread out the flavors in a perfect pattern, then you are going to adore these little breads. And the thing is, these are super, super easy to pull together. The fact that they are drop-dead gorgeous just makes them irresistible. Even if this is your first attempt at making raised bread, you will be successful. The actual hands-on time is minimal, as for the lion’s share of the prep you’ll simply be waiting around for the yeast to wake up, the dough to rise, and the buns to bake. 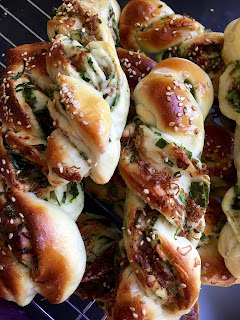 If you want, you can make these in a stand mixer with a dough hook or a food processor. It doesn’t really matter. But I like to just whip these up in a bowl and then quickly knead everything on a counter, since I find it’s even faster and simpler that way. I’m not sure of their history, but I’m guessing that these started out as one of Hong Kong’s many variations on the Parker House roll theme that has worked its way into so many Chinatown bakeries and dim sum teahouses. Perhaps Japan had a hand in this somewhere along the way, as its influence on Taiwan’s Western-style baked goods has always been pretty strong and, admittedly, delicious. But no matter what their provenance, these buns really took off as culinary stars once they took root in Taiwan. 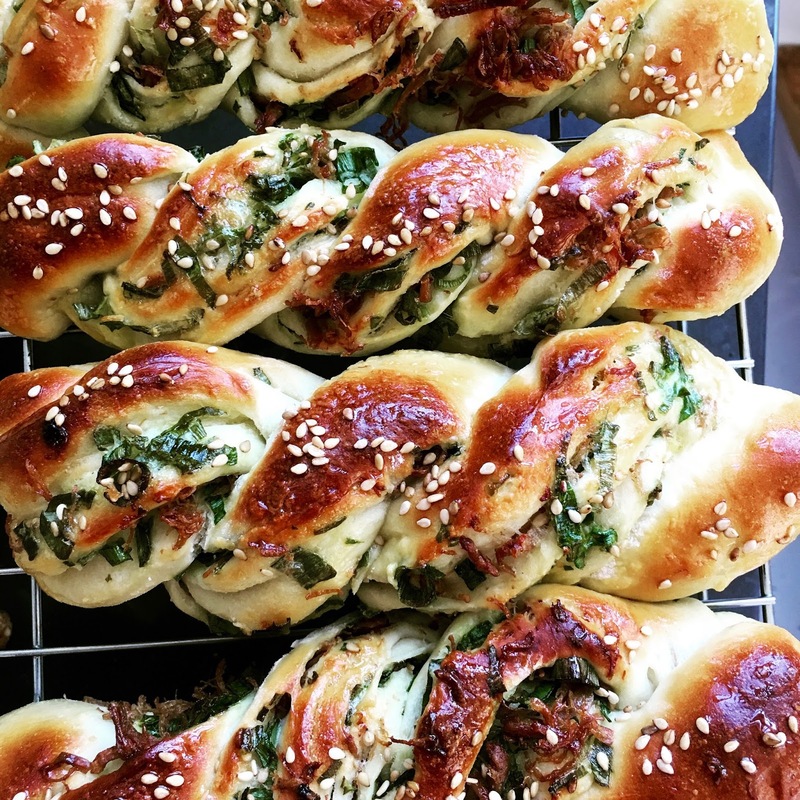 Fortunes have been made with bakeries specializing in these soft breads—both savory and sweet—and many a Chinese market on this side of the Pacific will have a beloved satellite bakery attached to it, or at least very close by. Taiwanese baked breads tend to be much softer and lighter than what we make in the West. 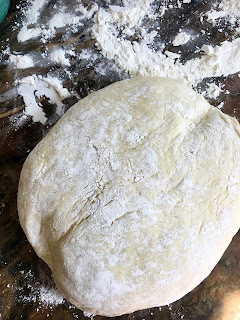 There are eggs and shortening in the dough to make the bread even fluffier, but the key to the perfect texture is (as with all Chinese pastas and breads) the flour. Try to find good Korean wheat flour, since it has the right amount of gluten and tends to be of excellent quality. The ones with the polar bear somewhere on the bag are my favorite brand. If that’s not an option, just use my go-to recipe for Chinese flour: 2 parts all-purpose plus 1 part pastry flour. Although the dough recipe is my own, the source for the shaping of these buns is an excellent blog called The Woks of Life. The ones they showed there were so beautiful that they really caught my eye. This blog deserves a lot of credit and is worth bookmarking, so here’s a shout out and a whole lot of thanks to this adorable family of food writers and bloggers! These freeze and reheat incredibly well, so make a big batch and stash them away for breakfasts and snacks. If you’re a vegetarian, leave out the pork fluff and you’ll still have amazing buns on your hands. 1. Mix the warm water, powdered milk, yeast, and sugar together in a large work bowl. Give the yeast time to wake up and become very foamy, which should take around 20 to 30 minutes. 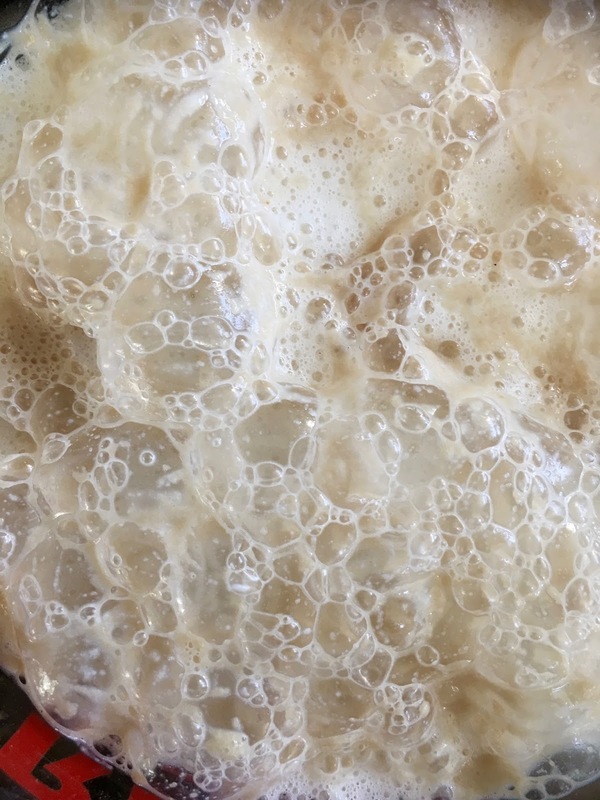 If you don’t get a good head of foam, buy fresh yeast and start over. 2. Stir the egg, flour, salt, and oil into the yeast mixture to form a soft dough. Flour a smooth work surface and dump the dough out on top. Quickly knead the dough, adding more flour as necessary to keep it from sticking, until it is smooth and bouncy. Roll the dough into a ball lightly flour it. Cover the dough with a clean tea towel, invert the bowl over the top to help keep the dough moist, and wait until the dough has risen to at least twice its original size, which will take about an hour. 3. Cut the dough into 16 even pieces. Toss them with flour and cover with a dry tea towel to keep them from drying out. Cover 2 baking sheets with either Silpat or parchment paper. Heat a convection oven to 350°F | 175°C (regular oven 375°F | 190°C) and set 1 rack near the center. Working on one piece at a time, roll a piece into a rectangle about 2 x 4 inches | 10 x 5 cm in size. Spread 1 tablespoon of mayonnaise over the dough and sprinkle it with about 2 tablespoons green onion and an optional 1 tablespoon of pork fluff. 4. Roll the rectangle up from a long side into a cigar, gently flatten it, and then cut it down the middle, leaving one end uncut. Lightly twist these two pieces together with the cut sides out so that they look pretty. Pinch the cut end closed. Place the bun on a prepared baking sheet. 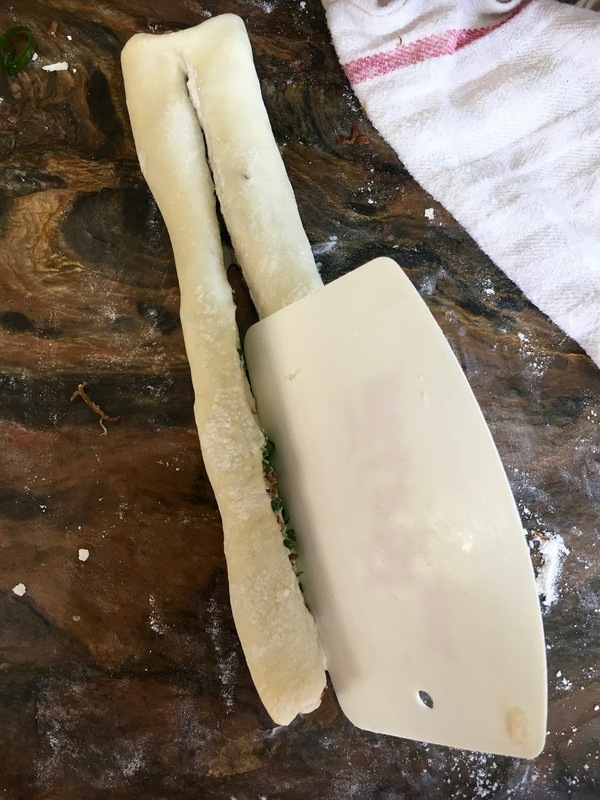 You should be able to fit 8 of these buns on each sheet, but be sure to leave around 1 inch | 2 cm between them on all sides, as they will rise. Repeat this step with 7 more balls of dough in order to fill up the sheet. 5. Brush the egg wash all over each of the twists, and then sprinkle them generously with the sesame seeds. Set the pan in the center of the oven and bake for about 13 minutes, or until the buns are a lovely golden brown. Repeat Steps 4 and 5 for the remaining 8 pieces of dough while the first batch is cooking. 6. Once the buns have baked, brush them with the sugar-water glaze, which will not only add an edge of sweetness, but also make them beautifully shiny. Refrigerate or freeze in resealable bags. To reheat, set them in a 250°F |120°C oven for about 10 to 15 minutes. You can of course use store-bought pork fluff. It is much lighter and flossier than the homemade stuff, and also has less flavor but a more delicate crunch, so feel free to use more. If you don’t eat pork, be on the lookout for chicken (jīsõng 雞鬆) or fish (yúsōng 魚鬆) or even vegetarian fluff (sùròusōng 素肉鬆). Nowadays you can find all sorts of pork fluff on the market. One is called ròusū 肉酥 and seems to be more or less the same thing as pork fluff, or ròusōng 肉鬆. Often stacked nearby will be containers of ròupú 肉脯, and from what I can figure out, these are more or less the same thing, just longer and consisting of slightly coarser threads than rousong. Again, you can use fluff of some sort here or leave it out. 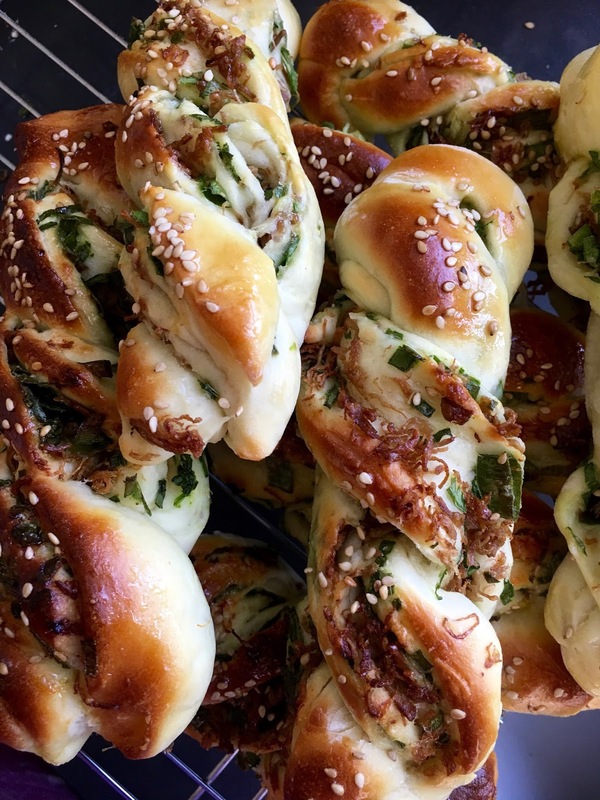 These buns will be fantastic any way you do them. These look wonderful! I am eager to try them. Let me know when you do. They are luscious, and I keep on making them on constant repeat. I want pictures of your creations, please! I am going to call this serendipity - mostly because today after an evilly long commute home from work (three hours. THREE HOURS!!! for a 20 minute drive that unfortunately had to be undertaken by bus!) all I wanted was congyoumian for dinner. And I made it and ate it all, and now look, there's green onions buns and I want some! Which I will make soon! Thank you for posting the recipe, I'll have to futz around with making it gluten-free but I am quite sure I can tinker. I am with you on the bingeing tendencies. These buns will definitely not encourage you to diet! If your gluten-free recipe turns out well, would you mind sharing it? I experimented with the congyoubing and THAT came out wonderfully well! 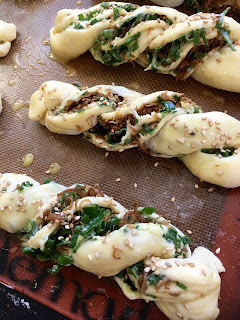 I used a recipe from Light Orange Bean ( http://lightorangebean.com/gluten-free-scallion-pancakes/ ) but I coiled it into the traditional rolled flattened shape instead and it still came out amazing! I have not experimented with the buns yet, but I will very soon and yes, I will share the recipe if it comes out well! Will this recipe still turn out ok without powdered milk? Made them last night and it was amazing! !